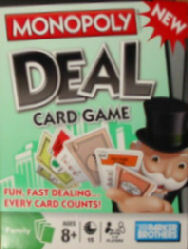 I do not like Monopoly but Rebecca does, so when I heard that this card game version plays in around 20 minutes, I thought Santa ought to add it to her stocking. We played tonight for the first time and it was pretty good. 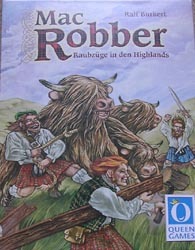 It is quite cut throat as you tend to try to set up how to steal properties or property sets from other players and it is very dependent on what cards you actually draw, but there is enough in there to get you thinking and, even if you do get terrible card draws, you only have to suffer for half an hour at most before the game ends. We played two games with three players in about 45 minutes and it was pretty good fun. The first game went so fast, Jan and Rebecca asked to play again. Inconceivable! Played this quick, light civ dice-rolling game at the weekend and thought it worked pretty well. I'm thinking of starting to add a section to the website that just has short snippets of information on game news, thoughts about games played or anything that just comes to mind. Just over two months to go until the big event and all the travel / accommodation arrangements are made. And surprise, surprise! Jan is coming with me this year. I'm not sure if she's been abducted by aliens and replaced by an imposter but I think I'll wait until after 19th October to try and find out. We're on our summer break now but the next session is scheduled to take place on Friday 31 August at Garry's house. This week's session on Friday 27th July will be at Garry's house. Just a reminder that this week's session on Friday 13 July is at Garry's house. Fragor Games have announced their new game to be released at Essen in October is Antler Island, a game about the lives of stags on a Scottish Island where they live for food, fighting and females. As normal, it looks like the playing pieces are going to be beautifully produced. My pre-order is already confirmed. The session this coming Friday, 6th July, will be at Garry's house. The latest issue of the excellent magazine, Counter, is out. 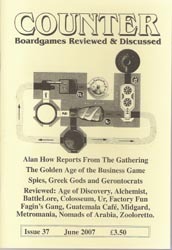 As well as the usual reviews and letters pages, this issue has an account of Alan How's first trip to the Gathering of Friends in Columbus, Ohio and the story behind Fagin's Gang, a game from new British company Ludorum Games. This week's session will be at John's house. Unfortunately, I am unable to make it this week. 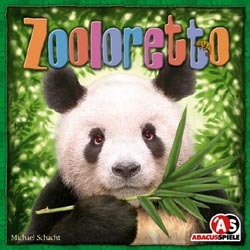 The winner of this year's prize for German family game of the year is Zooloretto, designed by Michael Schacht and published by Abacus in Germany and Rio Grande in the UK/North America. Zooloretto saw off opposition from four other finalists: Jenseits von Theben, Yspahan, Die Baumeister von Arkadia and Der Dieb von Bagdad. Congratulations to Michael for his first SdJ title and to the publishers, who should see sales of the game sky rocket. This Friday's session (22nd June) will be at Garry's house. The MCA are voted on by members of the Spielfrieks newsgroup and are geared more towards gamers' games than the Spiel-des-Jahres. The result is a bit surprising, therefore, as none of the winners are particularly heavy. For what it's worth, my votes went to Blue Moon City, Pillars of the Earth and Tempus. Just to confirm, this Friday's session on 1st June will take place at Garry's house. The latest issue of Spielbox arrived today and included a mini expansion to Transamerica / Transeuropa. Inside, the reviewers seemed to rate highly Notre Dame, Jenseits von Theben, On The Underground and Shogun (the new version of Wallenstein). One to avoid seems to be Project Skyline from Amigo. Just a reminder that this coming weekend sees the first UK Games Expo take place. 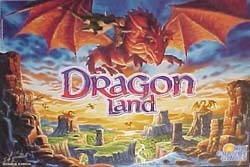 This is a convention where people can see and play games of all kinds (boardgames, RPGs, miniatures, CCGs etc. ), with over 75 publishers exhibiting their stuff. UK Games Expo will take place at the The Clarendon Suites, Stirling Road (off Hagley Road), Edgbaston, Birmingham (UK), June 2nd-3rd, 2007. I'm hoping to be there on the Saturday, particularly to look at some of the new games coming out from JKLM and the Ragnars. 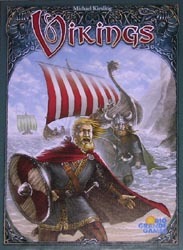 Chris and I had a go at the new Michael Kiesling game, Vikings, this morning. It was very, very good. Lots of nice little decisions packed into about an hour's playing time. And the result couldn't have been closer: We both ended on 74 VPs and I took the tie-breaker by a single coin (4-3). It'll be interesting to see how it plays with four but I'm sure it will be just as good. Highly recommended. Came home via Shire Games yesterday as Nick had received two games I've been eagerly anticipating: Vikings by Michael Kiesling (Rio Grande) and Caylus Magna Carta by William Attia (Ystari). As Mark G has just let me know that he can't make the planned session this Friday 25th May, there will be no session this week. I'll just have to wait until next Friday for my next big win! The winner is announced on 25 June 2007. A bit late for Steve's liking but, just to confirm, this week's session on Friday 18th May will be at Garry's house. With Notre Dame arriving in the UK at last, I decided to put an order in to Shire Games on Saturday. I was totally amazed, however, when they arrived, personally delivered by Nick and Sue on Sunday afternoon. How's that for service! (they were actually visiting someone locally but they still had to go a bit out of their way to find my house - thanks a lot Nick and Sue). And what did I get? 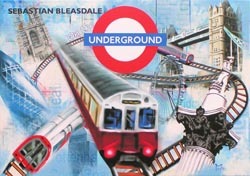 Well, along with Notre Dame, I took delivery of On The Underground and the Ark expansion cards. My choice for Game of the Month this time is this clever little card game from Eggertspiele. Sort of a trick taking game, where you are trying to win tricks containing gold coins and get your right-hand neighbour to win tricks containing apples. Quite tricky to get your head round initially but once you 'get it', there are some subtle choices to be made. And it's very quick. Don't forget, this week's session on 4th May is at John's house (not Garry's). Just a reminder that this week's session, 27th April, is again at Garry's house. A bit of time on my hands, so I decided to put together a new Bitz Quiz. Bitz Quiz 7 has 20 puzzlers for you to think about and can be found here. 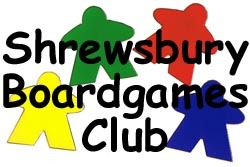 The next games session is this Friday 20th April and is at Garry's house. 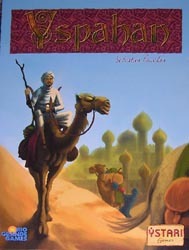 The latest edition of Spielbox arrived on Saturday, including both a Netherlands expansion for Age of Steam and an extra Library card for the forthcoming Caylus Magna Carta. Also of note is that Hans im Gluck's new game Wikinger received an excellent review and Portobello Market, which arrived from Germany on Friday, also was highly rated. 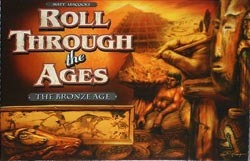 Played this Reiner Knizia roll and move game for the first time last night with Jan and Chris. Not bad, some planning needed to get your balance of gems right. Couldn't roll a 4 to save my life. Brings my unplayed games list down to 111. There's no session this week as it's Good Friday but the following week, Friday 13th, is at Garry's house. The more observant among you might notice that I've changed the layout of the homepage. Let me know if you see any glitches in different browsers or more generally whether you like the change or not. Click on my name at the foot of the page to fire off an e-mail. I've just given the homepage a bit of a springclean to try and ensure it changes a bit more regularly. 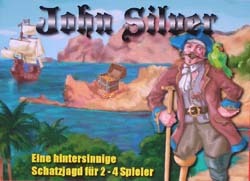 So you'll see the latest session reports on the front page together with a pic of our most recently played game. I've also added this year's HOF summary for ease of reference for those interested (Nige). Finally, a random bit will appear each time the page loads to test the old grey cells. More bitz to be added soon. Just finished the job of entering all my owned games into the database. By my reckoning, the total is 607, which is a bit lower than I had anticipated - maybe Jan has been selling stuff secretly behind my back. I guess that means, though, that my collection isn't big enough and I ought to be buying even more games!!! Last Friday saw us enter the world of H.P Lovcraft's Cthulhu. 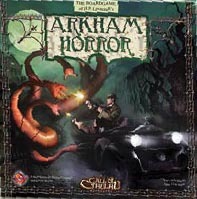 Arkham Horror is Fantasy Flight's new game and you can read the session report here. The latest reports from 15th and 29th July have been added. Take a look on the Game Sessions page for Palazzo, Mac Robber, Typo and Detroit-Cleveland Grand Prix. The seemingly never-ending task of getting all the old session reports into the database is now finished. Hurrah! 320 of them in all over four years. There are still a few more jobs to do though. I've got to get the Bitz Quiz stuff transferred across. It would be nice to have a random "bit" appear on the front page as well so I'll think about how to do that. The database also needs expanding to include other games I've acquired over the last couple of years that haven't been played at the Club. Then there are some page layouts that could be made a bit more interesting... Hmm, there's still quite a bit to keep me occupied. 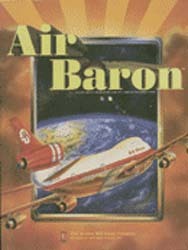 By the way, the latest session report details an extremely fun game of the old Avalon Hill game, Air Baron. I'm a bit late reporting this, due to my time being spent over the last few weeks revamping the site. However, this year's SdJ went to Zoch's very clever waterfall game, Niagara. I think it's a fairly good choice for the market the SdJ is trying to reflect (i.e. family games), but out of the finalists, I would have chosen either Verflixxt (Ravensburger) or Around The World in 80 Days (Kosmos). The other two finalists were the two player game, Jambo, and Himalaya by Tilsit Editions. It has taken a while, but I'm now happy that the revamp of Trickylight to a database-driven php site is now far enough advanced to let people know that we're up and back in business. Some of the transfer of past information from the old site has still to take place but the nuts and bolts appear to be there and working. Anyone spotting any problems or ideas for further improvement is very welcome to drop me a line by clicking on the e-mail link at the bottom of each page.